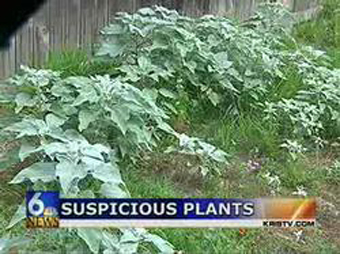 According to local news station KRIST KRIS, the plants were, in fact, a common weed called "horsemint." Appearance: According to Wikipedia, "The leaves are oblong-elliptical to lanceolate, 5–10 cm long and 1.5–3 cm broad, thinly to densely tomentose, green to greyish-green above and white below. The flowers are 3–5 mm long, lilac, purplish, or white, produced in dense clusters (verticillasters) on tall, branched, tapering spikes"
Appearance: Looks like a marijuana plant, for Christ's sake. Scent: It smells like goddamn weed.